Shear walls nailing is a huge part of shear wall construction which can be very different from framing walls such as load bearing wall or non-bearing wall. Studying the important components that make up the walls for shear resistant is an important step to framing walls correctly. This understanding of walls to resist shear forces can also be helpful in one’s ability to know that removing walls such as this can be catastrophic not only to the life of the structure but the occupants as well. 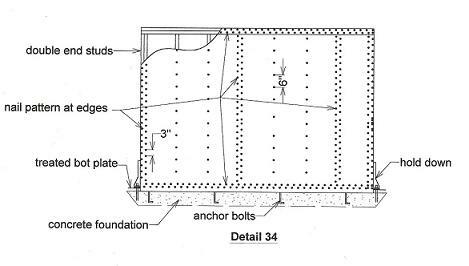 Detail 34 below shows the major components that makeup the walls that are designed to resist shear forces. This detail is very similar to the standard detail used by engineers to build the lateral resistant walls. 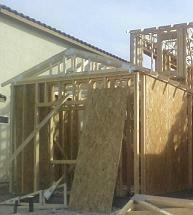 framing a house. The nailing pattern shown in detail 34 is typical in walls that are designed for shear resistant. In this detail the waferboard sheet at the edges or at the corner of all sides of waferboard the nails are typically 2 to 3 inches on center and are done in two rows staggered. Study show that failure of shear panels begin at the edges thus the closeness of the nails at the panel edges. On the other hand, the middle of the panel nail spacing are farther apart suggesting lesser forces at the middle. As seen on the detail, this nailing schedule is tedious work. By following the nailing schedule, it will require approximately 140 nails for each 4x8 wafer board sheet. For a single floor 40x40 ft building it will require about 5600 nails which can be time consuming if done by a hammer not a nail gun. 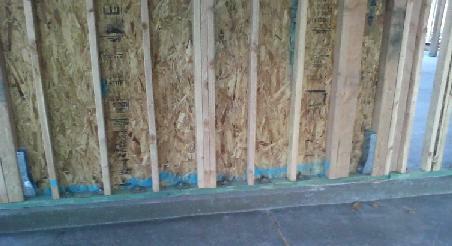 The waferboard 7/16 is the material of choice for exterior wall and roof sheathing. Plywood priced itself out of this application because waferboard is a lot less expensive. When nailing the waferboard sheets, it often become a challenge finding the studs. 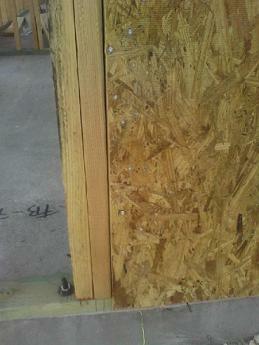 To combat this framers us chalkline to mark the centerline of the stud for nail placement. 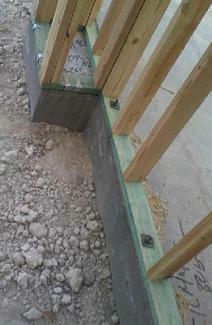 The nails used for walls for shear are 8d 2-1/2 inches long. As seen on detail 34, the spacing of the studs are extremely important because it will minimize the cutting of the waferboard sheets. The stud spacing of 16 or 24 inch on center will match exactly the 4x8 sheet dimension whether standing up or laying sideways. The closest stud spacing I had seen is 8 inches on center which can still with the 4x8 ft sheet. Another important feather of detail 34 wall is the use of hold down and straps. These are added at the beginning and end of the walls especially short walls and walls that are interrupted by window and door openings. Obviously for shear walls to work, all elements must work together. A weak concrete footing and foundation can be easily toppled even if the walls were built correctly. Likewise if the foundations are strong but there were not enough anchor bolts, the structure can still fail.